Air pollution is one of the main problems that humanity must face. It is a matter of special impact in the urban areas where most of the world’s population is concentrated. The role played by technology to alleviate this problem is key, which is why Smart Cities opt for solutions that allow the monitoring of outside air quality. Before describing the advantages of monitoring outdoor air quality with sensors, it is convenient to define some key concepts: air quality, environmental monitoring and low-cost sensors.Air quality refers to the concentration of a pollutant in the atmosphere. This value varies according to the weather conditions, which are a fundamental factor in defining the capacity of dilution of the atmosphere. To assess how good or bad air quality is, the legislation establishes the so-called levels of immission, which determine the effect of a pollutant on health or the environment. The environmental monitoring of air quality, as described in the Urban Emissions website, consists of the “exercise of measuring the environmental levels of air pollution in an area”. In this way, we know the state of the air quality breathed by the inhabitants of that area. Monitoring itself does not reduce pollution, but its long-term measurement provides information on pollution sources and their levels, allowing to establish patterns that help in the formulation of control policies. Regarding low-cost sensors, although there is no consensus definition, organizations such as the World Meteorological Organization (WMO) describe them as those devices with a lower “initial cost of purchase” compared to the cost of acquiring a product only a reference instrument that measures the same atmospheric parameter or a similar one » (Lewis et al., 2018), instruments that can be between € 5,000-30,000 per sensor (Castell et al., 2017). And, although the term “low-cost” does not mean lower performance, it is necessary to make clear that the values obtained do not yet reach the accuracy of correctly maintained air quality stations, so that these types of sensors “are not currently a direct substitute for reference instruments, especially for mandatory purposes. However, they are an interesting complementary source of information on air quality, provided that an appropriate sensor is used “(Lewis et al., 2018). This is, possibly, one of the main advantages. The measurement systems offer information relative to specific coordinates. The concentration of polluting gases at a point and in/at another one located 500 meters away, for example, does not have to be the same since a simple change in the direction of the wind can exert a remarkable difference. This hyperlocal characteristic and the high cost of traditional measurement methods means that low-cost sensors are a viable alternative that allows the monitoring network to be extended, using the data from the reference stations as a source of comparison. As an example of this use, it is worth mentioning the ambitious project being developed by London, where 900,000 pounds will be invested to improve the monitoring and collection of information aimed at creating models through this type of devices. Management of emergency response, detection of dangerous leaks and supervision of compliance with the rules at the source. The portability and capacity to be calibrated in situ according to the conditions of the place (in addition to laboratory), an aspect this last one that allows obtaining a more reliable reading, so that these devices can be used to control the contamination levels in the emitting sources or emergency alerts. 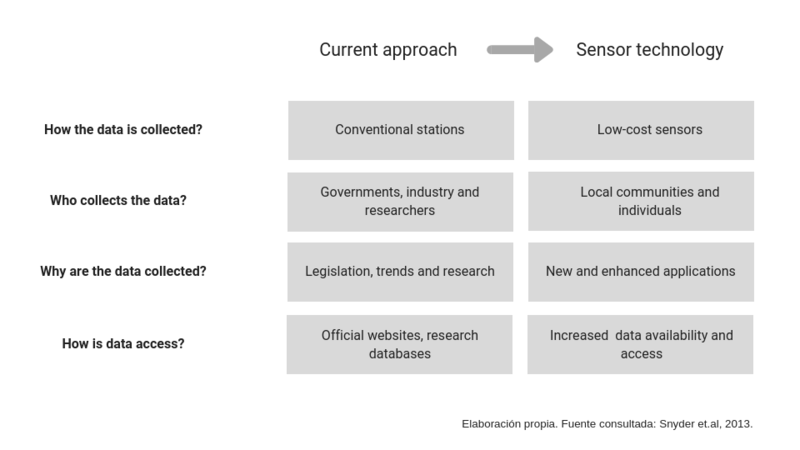 Most low-cost sensors respond well to high concentrations of polluting gases, which also makes them suitable for cities in developing countries that lack monitoring networks. Improvement in the creation of predictive models and knowledge between air pollution and human health. The improvement in the methodologies for the creation of pollution models and maps is gives greater utility to the data provided by the low-cost sensors arranged in the form of a network, achieving “reproducing official values averaged throughout the city with an R2 0.89 “, as in the case of Oslo (Schneider et al., 2017), or Heathrow Airport in London, where a useful predictive pollution model has been created (Popoola et al., 2018). The massive data of air pollution and its analysis and representation later crossed with data of hospital admissions or medical consultations can also lead to a better knowledge of how air pollution and human health are related. The fact of being able to collect more data at a lower price can also facilitate the work of raising awareness in society as long as the information is made accessible. Not in vain there are more and more parents who admit their concern about the levels of pollution that their children, one of the most vulnerable groups, bear on the way to and from schools. Why monitor outside air quality in cities? To prevent climate change: emissions of some greenhouse gases such as methane contribute to an increase in global temperature. Some sources, such as the United States Environmental Protection Agency (EPA), also point to a direct link between air pollution and climate change, a relationship that would result in an intensification of their respective consequences. To reduce mortality levels: the WHO estimates that 4.2 million people die every year as a result of their continued exposure to harmful levels of outdoor pollution. The highest risk groups are the elderly, people with chronic disease and children, although numerous studies also suggest conditions for pregnant women. To reduce economic losses: according to data published by the World Bank in 2016, the economic losses derived from the deaths attributed to pollution accounted for only 225,000 million dollars in 2013 alone. To these figures, we must also add the hours of work lost due to sick leave and the expenses resulting from the increase in hospital admissions. 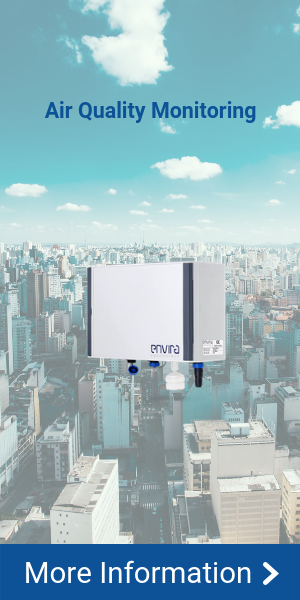 ENVIRA IoT specializes in the design and installation of equipment for the implementation of IoT sensor networks in Smart Cities. These are high-performance devices with precision in the monitoring, treatment and transmission of the captured data.